Skin Deep pairs ingredients in more than 41,000 products against 50 definitive toxicity and regulatory databases, making it the largest integrated data resource of its kind. Why did a small nonprofit take on such a big project? Because the FDA doesn't require companies to test their own products for safety. 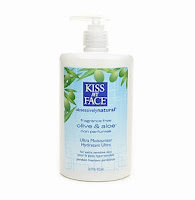 This evening I looked up a product sitting on our bathroom sink: Kiss My Face Fragrance Free Olive & Aloe Ultra Moisturizer. According to the health hazard score, it received a 4 out of 10 (10 being the most hazardous). This is confusing to me since the label on this moisturizer has the tag line "obsessively natural". Apparently not, Kiss My Face. I'm guessing if this line were truly obsessive about being natural, it would rate lower than a 4. I like using this site but...I'm not a science-type, so I'm not sure what some of the statistical info means (such as the"data gap" percentage). If you have any insight to that issue, let me know. I'll keep using Skin Deep, despite being statistically challenged.